I absolutely love this idea. Not only because I'm short, but because it's practical and looks really cool. Apparently it's only an idea and not something actually for sale. It wouldn't be too hard to put together if you're a DIY-er, though, and it's definitely something I would like to see for sale at some point. 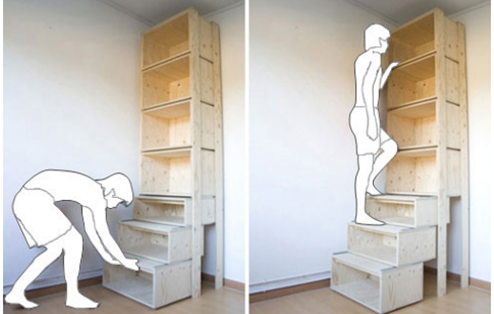 This is mentioned specifically as a book shelf (and I think it'd be a lovely modern addition to any home). 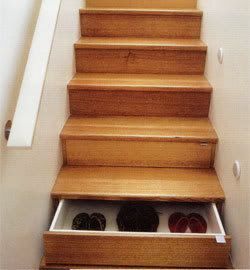 It could also be utilized in a pantry (or 'as' a pantry) or storage space in larger closets, etc. No longer do you have to only put things you rarely use on the top shelf and make every excuse in the world not to climb up there to pull things out. Because it goes all the way to the ceiling, it adds extra space to areas that you wouldn't otherwise use. Lifehacker (the site I found this through) also talked about a similar nifty idea. These are definitely things I would like to keep in mind for the future. Absolutely amazing! Totally love it! Creative indeed. And hope you don't mind, happy belated blog birthday! I hope I'll remember my first blog birthday next year. ha..
Keep at it and you'll remember!